1) Cancellations less than 30 days prior to arrival date will forfeit 100% of the deposit and any rental amount paid. The Summit is located on the edge of the most majestic, sugar white beaches in the world. 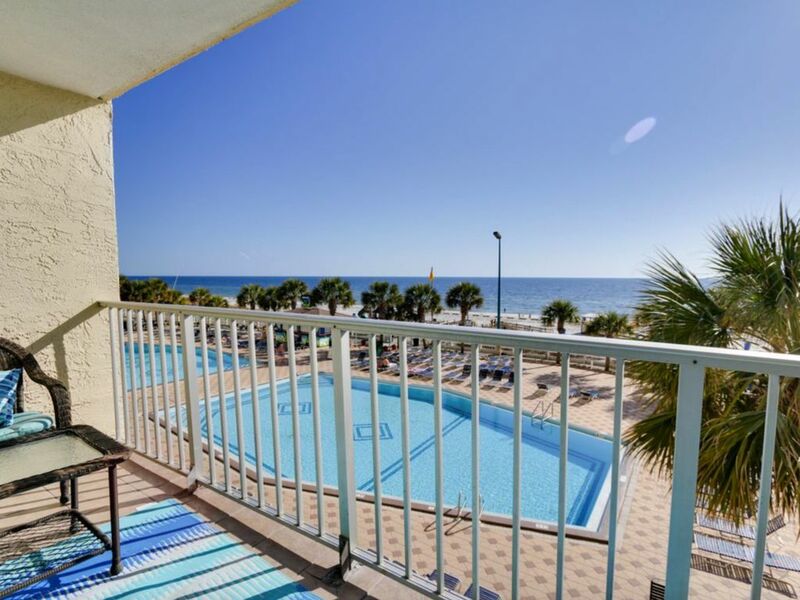 Our condos are located directly on the beach!!! Only a few steps from the sand. Doesn't get much better than this!!! FREE BEACH SERVICE in season!! This complex has everything you will need for a memorable vacation; two large Olympic-sized pools (one heated), two children's pools, two outdoor hot tubs, indoor spa, poolside store, snack bar, game room, tiki bar, oyster bar, indoor exercise rooms with saunas, and many, many other amenities... too many to list. Our condos will comfortably sleep up to six guests with one king-sized bed in each unit, two bunk beds in a hallway alcove in each unit, and a brand new queen-sized sofa sleeper in the family room of each unit. The family room and bedroom each have TVs with remotes. Each condo has a fully equipped kitchen with microwave, dishwasher, refrigerator w/ice maker, full stove/oven, cooking utensils provided, toaster, blender, coffee maker, and washer & dryer. Must be 21 or older to rent. N0 PETS & NO SMOKING. Hey everybody, I’m Caron. My family & I live in Alabama. I was in the ‘kid business’ working as a school bus driver for 25 years while I also assisting my husband in our family business, and managing my vacation rental business. I’ve been told staying active keeps you young…so I’m active active active !! I'm the mother of three wonderful children, and Grammy to two precious granddaughters... Miss Mikinzee & Miss Aubree!! I love love love my girls!!! I have another little one in my life and her name is Bella. She is my beautiful Yorkie. The Summit is a unique place to stay because everything you will need for a memorable vacation is right here!! I personally love Bikini Bob's which is located on the east end of the property. If you get here and realize you forgot something...just walk down to our little gift shop just off the pool deck. Just pack your family & your bags and get ready for a fun filled vacation!! Linens are provided; however, we the number of towels & wash clothes are limited so you may want to bring extras from home! DON'T FORGET TO PACK YOUR BEACH TOWELS! Each unit has access to 1 parking spaces. The front desk will provide parking passes upon check-in. You will love the pools! I stayed in unit 312. The unit was nice. It was clean. The best part of this unit is that it had laundry in the unit. It was a great time saver. There was plenty of cookware/dishes/etc and we ate in most of the time. I even used the crock pot to make a pork loin. Beach chairs were included as well and we took advantage of that. There were plenty of towels for showers. There was free wifi and cable. This unit was better than the last one I stayed in a few years ago. If I was going to stay in The Summit again, I would rent this particular unit again. The bar staff at the outside Tiki Bar was great. The pools were clean and one is heated. The little snack shop downstairs...15 minutes to wait for them to put 3 already cooked hot dogs on buns. They were definitely not in a hurry. The day we showed up, the elevator was stuck with a bunch of people on it. The garbage shoot is always full and blocked up. One day I was woken up at 5:45 by staff that had decided that was a good time to rearrange all the deck furniture...ALL THE DECK FURNITURE...around the pool area. Dragging chairs across the cement. It was loud. It was disrespectful. It was ridiculous. This is the second time I have stayed at The Summit. The first time, the college kids pulled the fire alarm twice in one week in the middle of the night. Thankfully, that didn't happen this time. The beaches here are amazing. The sand is fine and perfect and the emerald waters are amazing even though it's still a little cold at the end of March. The March ban on alcohol on the beach wasn't obvious so be warned. The police were patrolling every day. There are a million places to eat in the PCB area. We had good oysters at Hammer Head Freds and good fish at Scampy's. Captain Jack's is a regular destination for us to eat tons of crab legs. Having said all of this....I have been coming to PCB for years now. It is one of my favorite places and I really enjoyed my stay there again this year. Lovely updated condo with all the appliances we might need and located in a building that is maintained and friendly. Want to book again for next year. Also appreciate all the music activities for the snowbirds that are available in the area and advertised thru the PCB Tourist Association. Beautiful Unit - Awesome amenities!!! My family and i will be going back. LOVE CARON"S CONDOS!!! Outside staff could be friendlier, office staff is great. Love the amenities. We loved every minute of it , beautiful views of the ocean , very neat and clean condo , very comfortable beds , all the cooking items you could need , and Caron is awesome to work with , she really made our Florida Vacation everything we wanted it to be . Even has a large new stackable washer and dryer which made it even better i promise you that. Thanks Caron Davis for everything.